I just got back from Austin last night, and I miss it already! Despite the sweltering heat, I love that city all of the time. Great food, great people, and beautiful scenery. On Sunday, we drove out to Wimberley for my cousin’s wedding. It’s about an hour outside of Austin along Cypress creek. Some of my cousins own a really beautiful piece of land there where my great aunt Sada used to have a sleepaway camp for girls in the forties and fifties. 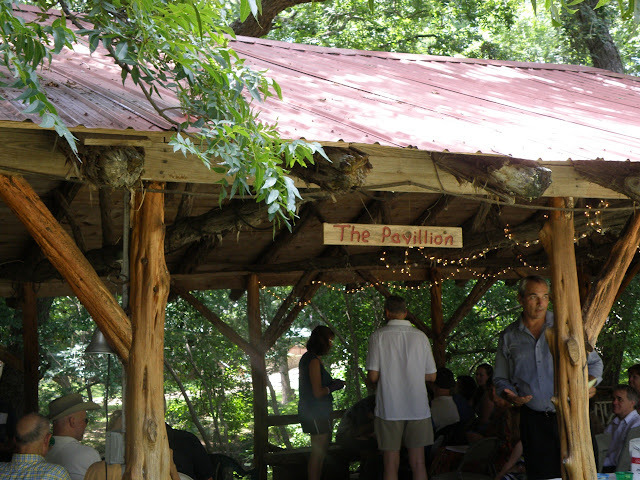 My cousin and her now-husband were married outside under the pavilion, with the creek in the background. It was so pretty! 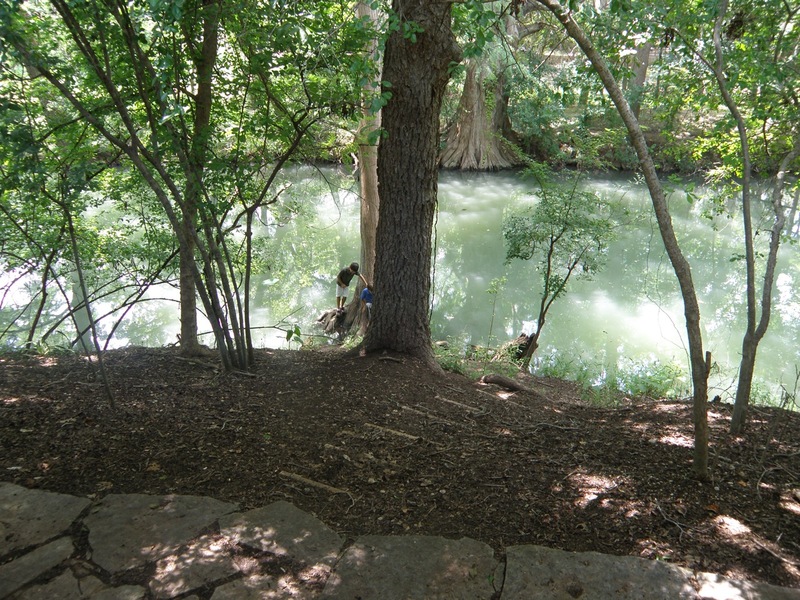 Some of the trees there (like the big cypress on the other side of the river in this picture) are over 1,000 years old. 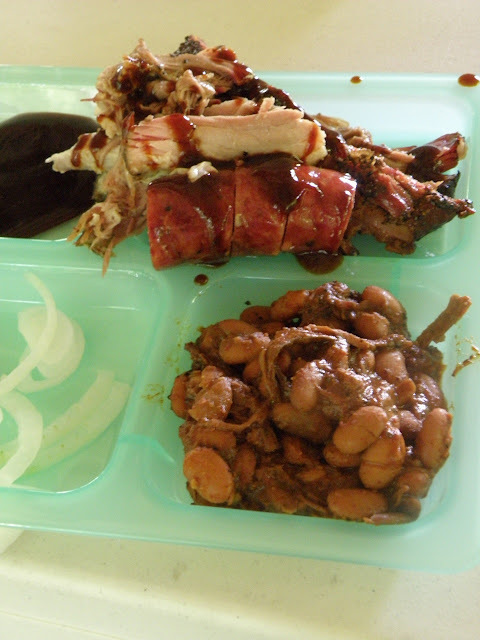 After the ceremony, we had barbecue from Franklin for lunch. I was really glad to get to try Franklin at the wedding, because unless you order a large amount for a party, you have to wait in line to get served before they run out. The line starts before nine even though they don’t open until eleven. That is too intense for me! I thought the barbecue was very good–we had brisket, sausage, ribs, and pork. I am not sure it was the best barbecue I have ever tasted, but I did enjoy it. I’m glad I didn’t have to wait in line for two hours to get it! For dessert, we had chocolate cake, peach cobbler, my almond blueberry pie bars, and Blue Bell vanilla ice cream. I know I might be biased, but my mom and I both thought my pie bars were the best part. They are SO good with vanilla ice cream on top. A couple of people at the wedding were gluten-free and especially appreciated having them, but everyone really enjoyed them and we took home an empty platter. The next morning, we were back at Texas French Bread for breakfast. I know it’s boring, but I think we ate there almost every morning. I didn’t get tired of it though, because it’s so good. It’s also only a ten-minute walk from my aunt’s house, and usually that’s as far as we could stumble first thing in the morning. I walked down there and my mom and aunt came later in the car. I was hungry and they take forever to get out the door! 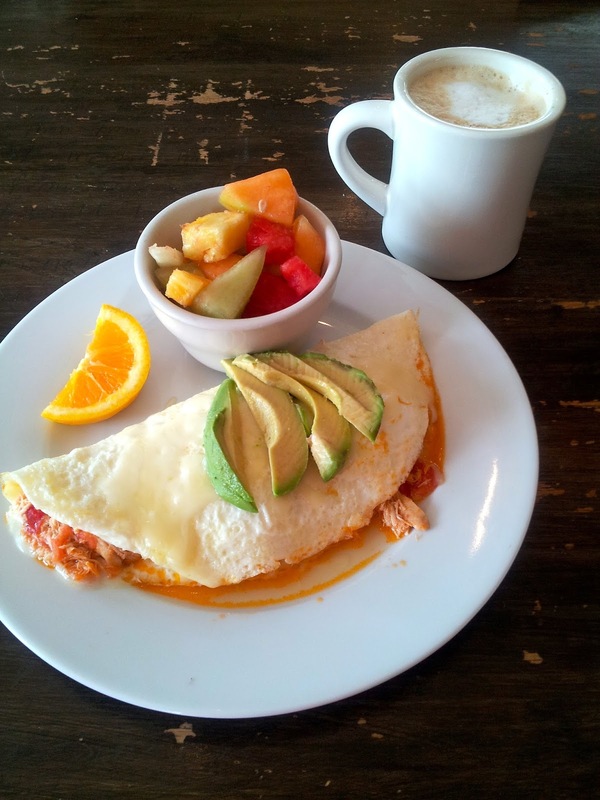 One day I had this delicious egg white omelet, which is stuffed with roast chicken cooked with tomatoes and onions and jack cheese, and topped with avocado. 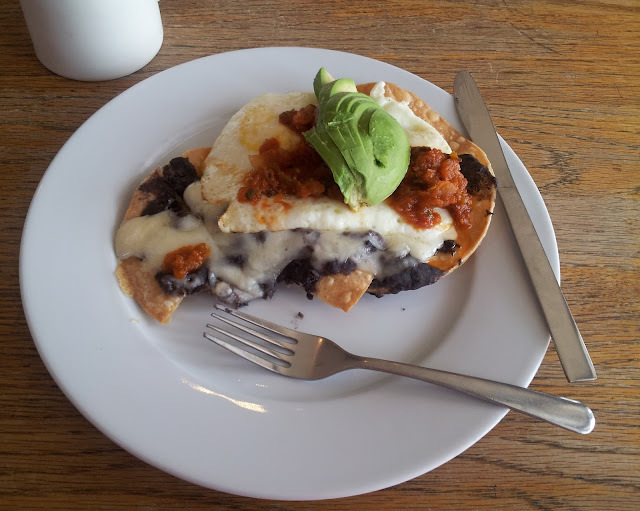 The next day I had the breakfast tostadas: two crispy tortillas topped with black beans, cheese, fried eggs, delicious salsa, and avocado. I think those were my very favorite. I have to tell you that Texas French Bread also serves dinner. I went with four of my relatives and forgot to take pictures, but everything was amazing. I had roast chicken with fabulously crisp skin topped with chili oil, and it came with grilled eggplant and tomato and an arugula salad. I REALLY wish there were a Texas French Bread in Boston. I brought home a bag of their coffee for Ben, so at least we have that. On Monday night, my mom and I got a late start and weren’t hungry for dinner until almost eleven o’clock. 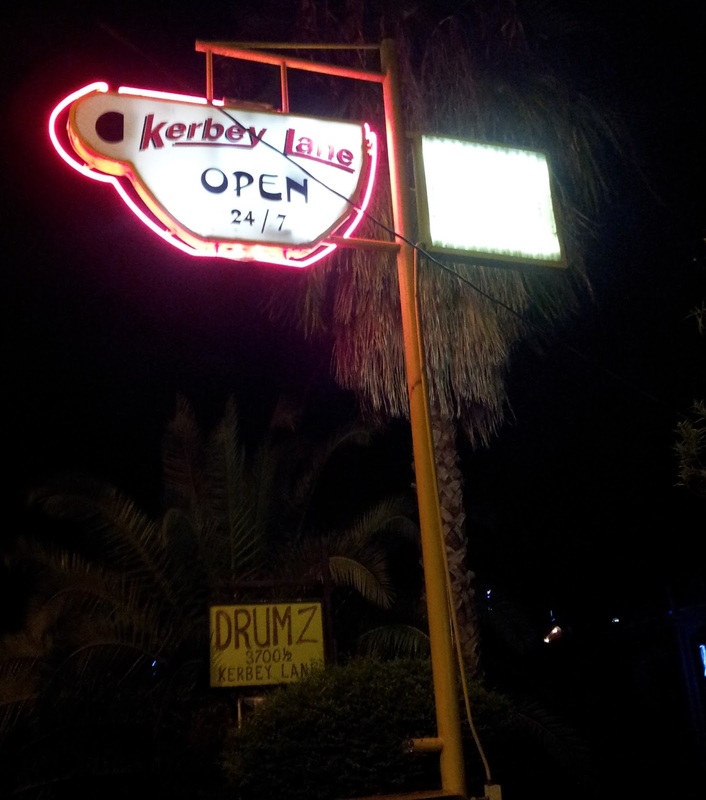 We headed over to Kerbey Lane Cafe, which is open 24 hours a day. I have a huge soft spot for places that serve breakfast around the clock. 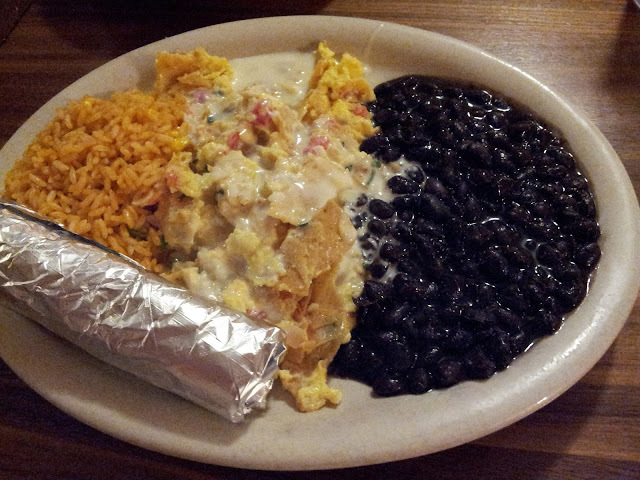 I ordered migas, and they were delicious. If you haven’t tried migas, you will probably love it: it’s eggs scrambled with tortilla chips, tomatoes, jalapeños, and cheese, sometimes with salsa on top. At Kerbey you can choose your sauce, so I got queso. It was a very satisfying breakfast dinner. 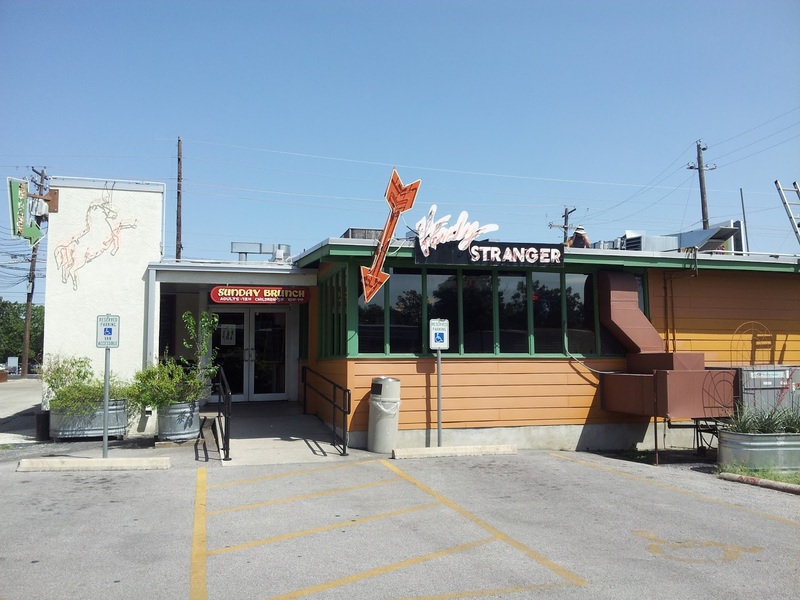 I have one more restaurant to share with you, and it’s Threadgill’s. Threadgill’s has been around since the thirties and started off as a gas station that got the first beer & wine license in the city. They’ve always featured live music, and Janis Joplin used to play there every Wednesday when she was in Austin. Apparently she was paid two dollars plus all the beer she could drink. See the guy on top of the roof fixing something? I felt bad for him, because it was SO hot. I hope they gave him all the beer he could drink when he was finished! Threadgill’s has good country food, and a huge selection of vegetables. They use the word “vegetables” broadly: the vegetables section includes sides such as macaroni & cheese and garlic cheese grits in addition to actual vegetables like collard greens and asparagus. Most dishes come with any two vegetables, and that’s my favorite part. 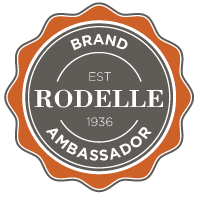 Also, I THINK you can still get unlimited free refills of your veggie sides, but I never have room for that. 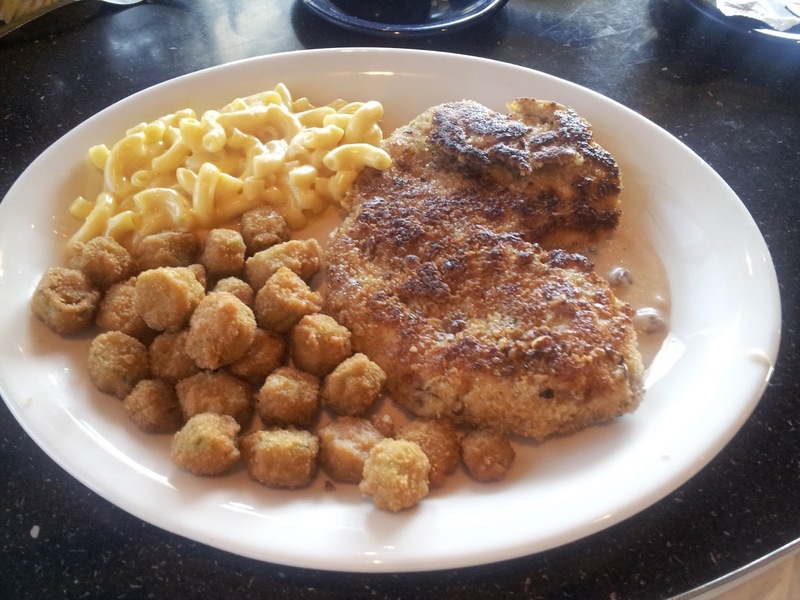 I ordered the pecan-crusted chicken, and while I didn’t love the sauce (too much cornstarch), I did LOVE both my sides: fried okra and macaroni and cheese. My mom got blackened catfish with Cajun spices, and that was also really good. I hope you enjoyed reading about my Austin eats! If you have any favorite Austin restaurants you forgot to tell me about, leave them in the comments and I’ll try them next time.